And just like that, there's a new DC superhero in town. The Warner Bros panel at San Diego Comic-Con was the biggest of the entire weekend, and at the epicentre was its DC superhero roster, with the universe now being called Worlds Of DC. For those in attendance, there was a first look at Patty Jenkins' Wonder Woman 1984, which was apparently an absolute blast, while both fans in Hall H and around the world have been able to feast their eyes on trailers for Aquaman and, more surprisingly, Shazam! It's just not a surprise because it wasn't expected online, but because of how good (and different) it looks. The story of a teenage boy who is able to transform into a superhero when he says 'Shazam! 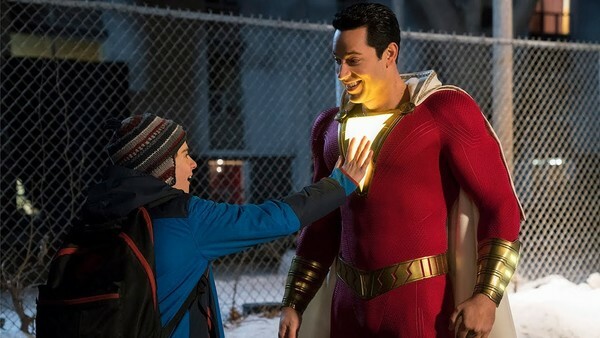 ', the movie stars both Asher Angel and Zachary Levi as the two sides of the character (who'll likely go by the name Shazam rather than the original Captain Marvel moniker, for obvious reasons), with Angel the teenage Billy Batson and Levi the fully grown hero. The trailer promises a side to the DC universe we haven't seen on the big screen before, and it's a great look for it.